There are myriad risks in adapting a feature film as a TV series, and Syfy’s 12 Monkeys is one that runs dangerously close to the clutches of audiences that hold Terry Gilliam’s 1996 film in the upper echelon of time travel fiction. Yet this small screen version manages to elude strictly comparative criticisms by overhauling many of the film’s details and only holding tight to the central premise of a guilt-ridden man trying to stop a devastating plague from wiping out the Earth’s population. If you can take one hour for the next 13 Friday nights to forget the movie exists, you might just like it. Nikita’s Aaron Stanford plays Cole, a guy on the wrong side of the law in 2043 who is used as the guinea pig for a time travel mission given to him by a mysterious group of underground survivors who wish to move back to the surface and repopulate the Earth. Back in 2017, something happened that wiped out billions of people, and it all ties back to the Army of the 12 Monkeys. No, seriously, the series isn’t interested in using the MacGuffin tactic that the film did. The Army did the damage here...probably. Although the whole “sending people back in time” thing isn’t an exact science just yet – as Cole does end up in a few mistaken locations that play their own part in the narrative – his initial goal is to contact virologist Cassandra Railly (Amanda Schull), who plays an important part in setting this entire rescue mission in motion. And though Cole isn’t supposed to hang around Railly longer than necessary, he is quite taken by her, and by the past in general. Don’t knock the freedom of taking a stroll outside in the sun unless you’ve been completely robbed of such things. Having seen the first two episodes, I can’t quite gauge where the series is heading, and that’s a big positive. I like the story in general, and I’m fully invested in seeing where the plot goes. But I can’t exude the same praise for everything else 12 Monkeys has going for it. For one, Stanford-as-Cole is a pretty terrible anchor for this series to have, as he’s neither the brain-warped drooler that Bruce Willis was in the film, nor someone with any discernible traits of his own. He’s just a temperamental dude who will apparently save the planet by being surly and yelling a lot. In comparison, Schull is quite good at appearing engaged in an unbelievable situation, and I think she’ll be the more interesting lead as time goes on. Quick shout out to Kirk Acevedo’s Ramses, the lone beacon of slightly comedic relief in this show. 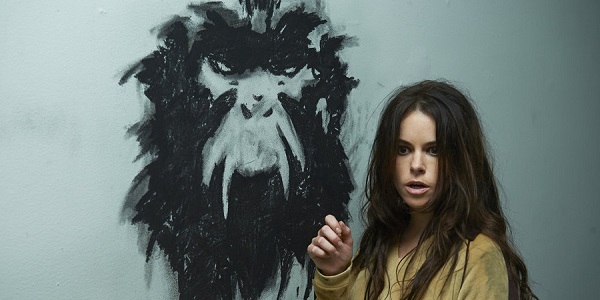 The elephant in the room is Emily Hampshire, who plays Jennifer Goines, the character based on Brad Pitt’s maniac in the film. She is as painful to watch as Pitt was joyous, though I’m inclined to blame the writing as much as the actress. Jennifer is also a loon, and ties into the monkey motif via sketches she draws on the wall, which is interesting enough, but she’s so over-the-top in playing “crazy” that it’s laughable. 12 Monkeys is far from perfect, but it’s an encouraging step forward in Syfy’s original programming, as it looks and feels crisp despite obviously working with a reasonable budget. Despite some performance issues, this story is still a captivating sci-fi adventure where the stakes couldn’t be any bigger. And even though I know the good guys will probably win out in the end, my money is on Tom Noonan. While there’s still time left, find 12 Monkeys when it premieres on Syfy on Friday, January 16, at 9 p.m. ET. You can find the first nine minutes of the show here for a preview.